The CAD Xpansion SDK is a library for software developers. It enables software manufacturers to implement the possibility to export 3D models into universal data exchange formats (STEP, IGES, STL) directly in their CAD, CAM, PDM and CAE Solutions, as well as import of 3D models and geometry recognition for certain models. STL is often described as the established de-facto standard format for 3D printing. STEP (STandard for the Exchange of Product model data) is an international standard, defined in ISO 10303, for the description and exchange of product data in CAD solutions. IGES (Initial Graphics Exchange Specification) is also a data format for data exchange between different CAD systems. Applications that support these formats provide the users with a high flexibility during their work with 3D models that have been created in different original (source) applications. The library provides a large number of program functions for the design of machine elements and assemblies in mechanical design, building construction, etc. It is also possible to create arbitrary assemblies based on separate elements. The import of CAD models and geometry recognition for certain parts are possible as well. Creation and export of complex units using operations like transformation, subtraction, unification, intersection, etc. Display of the loaded model and basic visual operations like zoom, rotation, selection of model objects, delete objects, etc. In order to test the performance and the functionality of the CAD Xpansion SDK, you can download the documentation (CAD Xpansion SDK Guide & Reference), a trial version of SDK and a simple test application: CAD Xpansion Viewer. The test application can be also found in the SDK subfolder “TestApp”. It offers a couple of examples that can be converted and saved in the STEP and IGES data formats. Import and visualization of other ready models from STEP, IGES, STL as well as shaft geometry recognition are possible as well, the example files are available. If you have any questions, please contact our support desk. Download the CAD Xpansion SDK Guide and read more about the functionality and properties. In addition, you can download a trial version here. The CAD Xpansion library can be ordered directly from soft Xpansion. The base price is 1000,- EUR plus VAT, if applicable. The amounts for individually ordered parts (e.g. 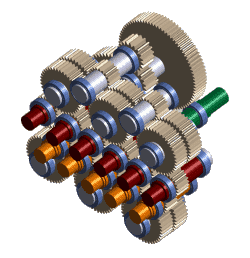 shaft, gear or beam) will be added to the base price. If any part is not available in the current version of the library, it can be created on request according to the clients´ specifications. Please send us your request by Mail or call us at +49 (0) 234 2984171. Export 3D models in three simple steps and process them in all widespread CAD systems, simulating programs and viewers. Click on the CAD/Step export button in the ribbon menu of MDESIGN gearbox, select the element to be exported, define file name and path of the STEP file to be saved. The only condition is a kinematically ready model in MDESIGN gearbox. 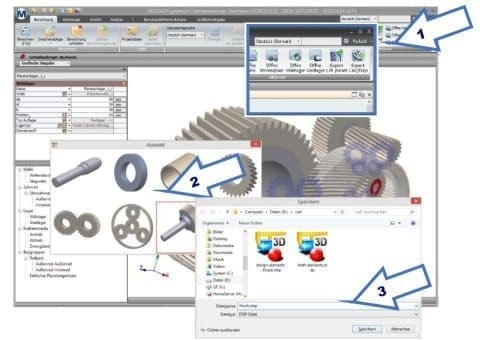 STEP files created with the CAD Xpansion SDK can be displayed in all tested CAD systems and CAD viewers: Autodesk Inventor Professional 2015, SpaceClaim Engineer 2014, Delcam Exchange 2014 R4, 3D-Tool, Catia, SolidWorks, SolidEdge, NX und Creo. 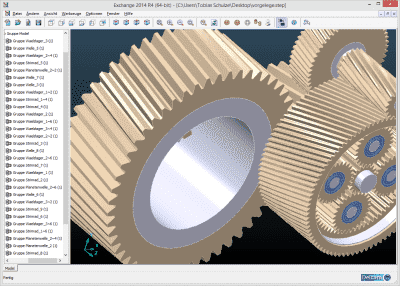 A short introduction to our CAD Xpansion Viewer is available here.